Thank you for the information. I’m not really surprised by this, but the developer states in Mountain Tweaks that it should be possible to use the app in 10.5 and 10.6. You might try contacting the developer. So what is the app doing? Thank you for your kind reply. When I’m trying to launch the app, it says “You cannot use this version of the application Lion Tweaks with this version of Mac OS X.” I tried the Mountain Tweaks too, but it’s doing the same. That’s what I thought. Apparently the version numbers in the app don’t support 10.5, which is odd given the developer’s notes. I’m sorry to hear this. 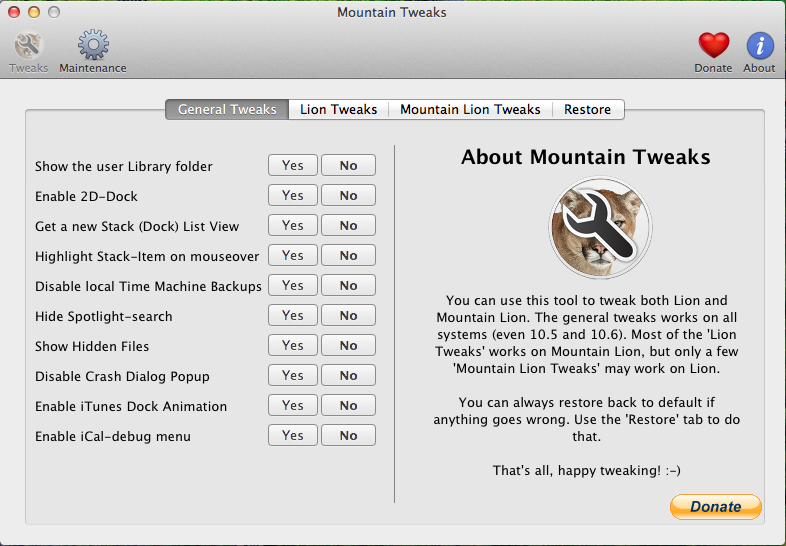 Again, you might go to the Mountain Tweaks website if you want to try to get this working on Leopard. In the meantime, I will update the article to reflect this new information. Thank you for the feedback and for visiting this website. Thanks for keeping us updated on Mac Stuff. Always interesting to read. Much appreciated.